Although all the buds are appearing on all the other trees, this imposing tree still lingers in its dormant state. It's one of the largest trees I've seen here in Alpharetta, and every time I go by, I have to take a picture of it, or wish I had my camera to take a picture. Excuse me. May I take your picture? This Saturday, we took our little family to the Alpharetta Children's Festival at Wills Park. Along with balloons, face-painting, the puppet show, and the petting zoo, we found some wonderful people willing to pose for impromptu portraits. I've taken to carrying incidental model release forms wherever I go now just in case. I love having the opportunity to offer a free e-mailed photo or two in exchange for a new face to shoot. These people were no exception. The family at the top of this post were kind enough to move to an area where we could have a neutral background (between an ice cream truck and a cotton candy vendor). And their cute daughter gave me the biggest smile after the "official" family portrait was taken. The young woman and her chihuahua, Romeo, caught my eye right away. Their similar coloring made them a striking pair. Pose for a picture? No problem; her mom's a photographer too. The father of the green-clad baby only had eyes for his daughter. That little one might not remember the magic show at the Children's Festival, but we won't forget that angelic face. So, if you're in a park and meet a brown-haired mom toting a camera, don't be surprised if she asks, "Excuse me. May I take your picture?" It might be me. And the next post might just be about you! In exchange for consideration received, I hereby give the photographer(s) permission to use my photographic likeness in all forms and media, and to alter it without restriction. I understand that no additional payment is due to me, and I hereby release the photographer and his/her legal representatives and assigns from all claims and liability relating to this usage. A copy of this release shall be as valid as the original. If Model is under 18: I, _________________________, am the parent/legal guardian of the individual named above, I have read this release and approve of its terms. My Early Motherhood Project is off to a great start! I have a few more moms lined up to model for me, but am looking for more. Details are available on an earlier post: Early Motherhood Project. Today, this little 6-month-old ran the gamut of emotions during our photo shoot: sleepy, hungry, angry, scared, confused, and absolutely desolate! Fortunately for us, little miss also had some smiles behind the tears. We spent the first half of the photo shoot trying to sooth a teething set of gums and helping little miss become acclimated to the camera. Even though the situation may have been a bit distressing, I have to admit, I still loved it! This is what I've been wanting to do for months: shoot photos of real babies and real moms. After little miss calmed down, we took her outside to sit in the grass for the first time. She didn't wait very long before grabbing that fistful of grass. Let's add one more emotion to today's list: curious! This mom and baby pair are the first in a project I'm working on about early motherhood and childhood. I wanted to catch the tenderness and obvious adoration between the model and her daughter. It was a cold day, so we mostly stayed inside and used available light from the windows to create these images. I'm especially proud of the top and bottom pictures. That little baby grip on the pinky finger is one of the best parts about holding an infant. I'm still in search of more models for this project; so here are the details. Marchet Butler is looking for moms, babies, and young children to model for her photo project celebrating breastfeeding, early motherhood, and childhood. This photojournalism project will feature candid images taken in the model’s home. Models can expect a daytime photo session in their home (Roswell and Alpharetta area) that will last about an hour. Participants must sign a model release for themselves and their child or children. In return, models will receive high resolution digital files of the best photos from their session at no charge. If interested or for more information, please email Marchet at marchetbutler@gmail.com or call 770-363-1547. The vines here grow as thick as tree branches. Winding their way up . . . everything, they create images of beautiful braids. I've been thinking a lot lately about the kind of photography I like to shoot best. It's the candid work I do, the photojournalism-style photos that capture an emotion, a story, or a pivotal moment. Perhaps it's just the yearbook teacher in me, but I feel as a photographer, my role is not to create reality, but to capture it. Take this photo. My son and I were invited to a birthday party for his little friend (in the pink dress). During the party, the babies started grabbing at one of the adults' cell phones. All of a sudden, there were tons of cell phones for the babies to play with (everyone pitched their phone into the pile). The birthday girl had to examine each one, leaving my little boy with whichever one she didn't want at the moment. 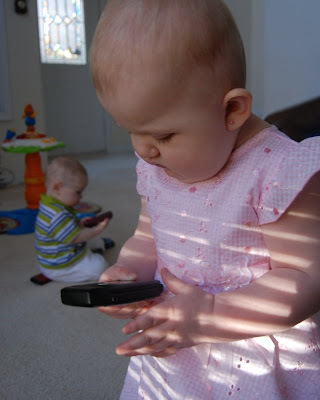 Eventually, my boy had no cell phones and birthday girl had them all. I love this photo because I remember the story that goes with it. Right now, I'm working on a project about early motherhood and babies. It's a photojournalism project I am doing to build my portfolio and shoot the kind of photos I love. I'm still looking for moms and babies to model for this project. Please email me if you are interested: marchetbutler@gmail.com. 1. Focus first; then shoot. Press the shutter release button (the button you use to take a pictuer) half-way down to focus on your subject. Then, press the shutter release all the way down to take the shot. So many people don't know this! But it's one of the easiest ways to improve your photography and avoid the "blurs." 1. Avoid using the flash indoors. When I first started out in photography, I was dismayed by all the dark shadows I was getting behind subjects when I shot indoors. I realized later that it was because I was using the built-in flash. (It has to do with hard light, if you want to look up soft and hard lighting basics on your own.) Without the flash, I have to take more pictures to get a good enough shot, but I'm a lot happier with the results. 2. Get in close! Choose ONE subject for your photo. Then get in close to and shoot that. Is it the face? Shoot just that. Is it the leaf or the piece of cake or the car fenders? Shoot only that. Don't worry about other people or objects you want to capture. Do them one at a time and you will get much better shots. For groups of people, think of the relationship between them as the subject, and not the people themselves. 3. Stick to a simple background. If you can position your subject in front of a plain, unimportant background, your shot will be much better. This is because there's no competition between your subject and the background. The picture above was taken with a big screen TV behind the baby. 4. Shoot at eye-level of the subject. This is perhaps most important for people shots. Generally, the best photos of children are taken on the ground where they are! Also, (I had to learn this the hard way) avoid taking shots "up" to the person's face. This makes everyone look like they have a double chin, even me! 5. Experiment! Do you know where your camera manual is? Have you even opened it? Have you ever taken your camera off of the "Auto" setting? Try it! You'll get a lot of bad shots at first, but then you'll start learning and that's when the fun begins. For more great tips on photography, I recommend Mastering Digital Photography by David D. Busch and How to Photograph Absolutely Everything by Tom Ang. These books are great for beginners!